Yes..yesterday 2 matches were there...Bari-Juventus and fiorentina-napoli.. I think they will telecast 1/2 matches a week..
Neo sports is also telecasting..tonight Inter-Bologna match is there in Neo..
Milan may sign Robinho as well...Berlusconikku pettennu enthu patty???? Now Milan have some depth as well..
Flamini, Abate, Gattusso in midfield. Inzaghi, Borriello/Robinho in forward line..
Managerless Bologna made life difficult for champions Inter at the Stadio Renato Dall'Ara as they held on for 0-0 draw after being put under prolonged pressure in the second half. Inter tried to assert their dominance but it was Bologna who created the early chances, with Henry Gimenez scooping over the bar after a mix up between Lucio and Julio Cesar. Gyorgy Garics then had a go, but his snap shot fizzed just wide. Inter's passing was uncharacteristically sloppy and they were second to most balls, as such Bologna grew in confidence as they attacked through Gimenez and Garics, while captain Marco Di Vaio was having an interesting duel with Walter Samuel, eventually drawing blood from the defender. Despite their territorial advantage Inter were unable to create any clear openings on goal and were restricted to a couple of longs rangers from Wesley Sneijder and MacDonald Mariga, even during periods of prolonged possession the Nerazzurri were passing in front of the Rossoblu defence. The home team continued to threaten especially down the right with Garics really giving Cristian Chivu a tough time. Gaby Mudingayi also broke from midfield releasing Di Vaio on the right and his cross found Gimenez unmarked but he was unable to keep his shot down and it sailed high over the crossbar. Just before half-time Sneijder went close with a free kick but it ended up inches over. More of the same ensued after the break but Inter slowly turned the screw, exerting more and more pressure on the Bologna penalty area, but still found that final pass lacking. Bologna did not give Inter an inch of space, even when the Nerazzurri did find room it wasn't long before they were in a sea of Rossoblu once more. The best chance came from a Sneijder free-kick but Emiliano Viviano was equal to the task and parried away at full stretch. By this point it was wave after wave of Inter attack as Samuel Eto'o hit the crossbar not long after. The Nerazzurri then laid siege to the home side goal, but in the end could not find a way through. Inter play Udinese at home after the international break, while Bologna face a tough trip to Rome as they take on Lazio in two weeks. Milan have completeld the signing of Robinho from Manchester City on a four-year deal, the Serie A club confirmed via their official website on Tuesday. "AC Milan communciates it has acquired the player Robinho, outright from Manchester City. The Brazilian has signed a contract with the Rossoneri club for four years," read the statement. The player has successfully undergone a medical and the Rossoneri will reportedly pay in the region of â‚¬15million for his services, although the fee was officially undisclosed. 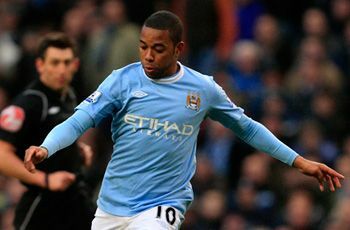 Robinho became a bit-part figure at Eastlands last season, eventually securing a move on loan back to his homeland with Santos.